Mitchell Gallery Exhibition Schedule 2007-2008. 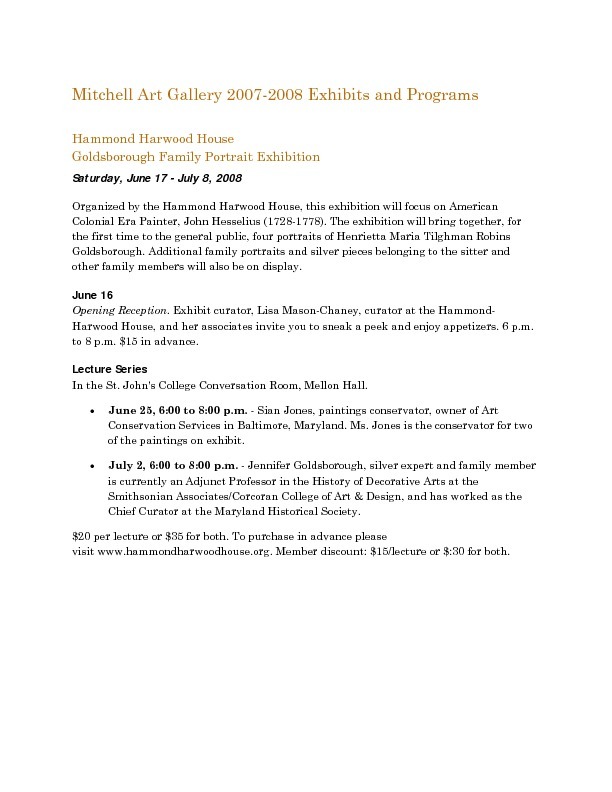 Exhibitions include: Hammond-Harwood House Goldsborough Family Portrait Exhibition; Image and Imagination: Anne Arundel County Juried Exhibition; Special Event: "Next Generation: pARTy Beneath the Stars"; St. John's College Community Art Exhibition; Robert Motherwell & Jasper Johns: Poetic Works as Metaphor; William Blake from the Syracuse University Art Gallery and Special Collections at E.S. Bird Library; The Inventions of Leonardo da Vinci; and The Artist Revealed: Artist Portraits and Self-Portraits. Mitchell Art Gallery, “Mitchell Gallery Exhibition Schedule 2007-2008,” St. John's College Digital Archives, accessed April 21, 2019, http://digitalarchives.sjc.edu/items/show/2705.